I would like to present a game played in the Insei League between Ilya Shikshin vs Artem Kachanovsky. The game was cloned to Russian room and provided with live audio commentary in Russian by breakfast. For the vast majority on KGS who does not understand Russian I decided to translate major comments by breakfast (all variations in the game were shown by breakfast; I only added comments which I remembered so please excuse me if I made somewhere a mistake). Let's see the current standings in group A (http://insei-league.com/league.php?l=A). Danigabi has a clear lead with perfect score 13-0 (player who gets the first place in A group gets 250$). Artem has already one loss so even if he wins all remaining games (not including games vs danigabi) he still will be only second as the minimum amount of games to be played is 12 and then a player with higher % win/loss gets the prize. So 12-0 score is better than 31-1, I believe we will some changes in the next month (Alex promised to make them) The tactics of only playing weaker opponents seems to be working as you can get the first place avoiding playing equal or stronger opponents. This should be changed in the next month in my opinion. 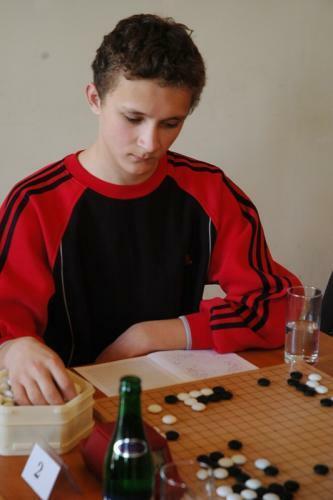 The game turned out to be very exciting, Ilya once again showed his powerful reading ability getting a clear lead in the yose after beautiful tesuji. Along with live audio comments by breakfast I really enjoyed the game and 2 hours were like 15 minutes :-). Breakfast promised that in the future he will try to arrange the same event with live audio commentary in English by one of the teachers in the Insei League. So don't miss it!